Synthetic Sealant. This is NXT Polymer Sealant "on Steroids". It's a higher-concentration version of the wonderful NXT protectant. This is not a wax but rather a synthetic protectant from the Meguiars laboratory. When you go to the lab to improve on wax, a natural organic product, you don't stop working until you have something better. Polymers, another name for "plastics", have been around for a long time. Many have been used in various automotive detailing products in the past but nothing has looked as good as this stuff before. When you apply this polymer to your car's paint you will first notice that it stays open longer than the waxes that you're used to. This gives you time to spread it more thoroughly, thinner and over a larger area. Everything you have to wipe off after you wax is waste. This polymer reduces waste significantly and stretches the area you can cover by as much as 25%. You must allow it time to cure. Give it 10 to 15 minutes. The lower the humidity the more time it needs. While keeping the paint relatively cool, apply M21 to the entire car (truck, bike, whatever), go get a beer, then test the area by drawing a finger through the waxed area. If it wipes clean then you can wipe down the entire car. After the job is done you see that your clay bar doesn't get as dirty when you clean the paint 6 months down the road. It washes more easily and black streaks on white tend not to stick. Try this stuff! You will be very pleasantly surprised at how good it is. 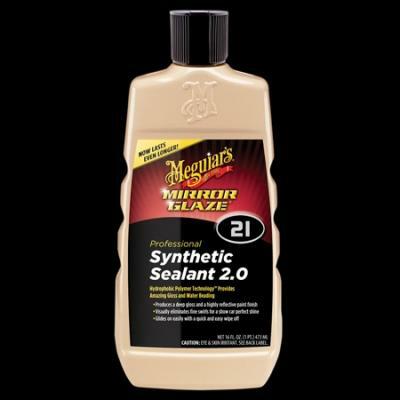 FYI, if you like mist and wipes, and you should, try the new Meguiars Synthetic Spray Detailer, M135. This is not a spray wax, per se, but rather a true mist and wipe which still leaves a little polymer behind. Convertees seldom go back.